And how would we have a massive reforestation effort while continuing our current farming practices? And how would we continue our current farming practices without them being carbon intensive? How much of the food grown in the Ogallala aquifer area is used as feed, or as the ethanol component in gasoline? Imagining things as they are just without adding greenhouse gasses to the atmosphere is possible (i.e. we can imagine it), but there's zero indication that it is technically possible. The toxic plume (of PFAS contamination) is spreading slowly and inexorably – not only under Schaap’s fields but across the Ogallala Aquifer, the largest aquifer in the nation, which spans 174,000 miles and parts of eight states. Running out of water is not the only problem there. Page 15 post 736 and a couple of following. So currently we are draining the aquifer and poisoning it and dreaming of two harvests. The only possible solution is to stop eating meat, all of us. What's happening: Flooding last month from heavy rains caused more than $3 billion in damage in Iowa, Kansas, South Dakota, Wisconsin and elsewhere, the AP reports. Among companies sustaining damage were Big Ag's Archer Daniels Midland, Cargill and Tyson. 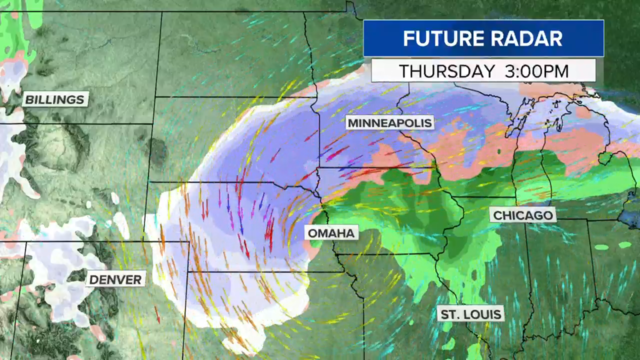 Second 'Bomb Cyclone' in Less than a Month Could Impact the Central US This Week? Only three weeks after a "bomb cyclone" — one of the most intense storms on record — pummeled the Plains and Midwest, another bomb cyclone of similar strength has been forecast. This spring storm seems poised to dump even heavier snow; it could also be followed by another round of significant river flooding. The storm will intensify as it enters the central Great Plains on Wednesday. The barometric pressure may drop to levels nearly as low as during the record-setting bomb cyclone in mid-March. In fact, this storm could tie or set April low pressure records. The latest computer models put the bullseye for the heaviest snow band from Sioux Falls, South Dakota, through Minneapolis east to Eau Claire, Wisconsin. Snow totals could be staggering, with some models showing more than 30 inches in some areas. Record flooding that has overwhelmed the midwestern United States this spring has taken a significant toll on farmers, and the U.S. disaster aid isn't covering crops lost by the floods. The federal policy states that the grain damaged from flooded river water has to be destroyed, and according to Reuters there's nothing the U.S. government can do about the millions of damaged crops under current laws or disaster-aid programs. Reuters reports this is a problem the USDA has never seen on this scale before because U.S. farmers have never stored so much of their harvests. Midwestern farmers have been storing their corn and soybeans in unprecedented amounts due to the U.S. and China trade war, according to the BBC. Last year, the USDA made $12 billion in aid available to farmers who suffered trade-war losses, but there is no program to cover the catastrophic and largely uninsured stored-crop losses from the widespread flooding. Nebraska's Gov. Pete Ricketts has estimated the losses to the agricultural sector alone at $1 billion. However, the damage doesn't stop there. States such as Missouri, South Dakota, Wisconsin and Iowa were also greatly impacted. ...On top of losing millions in crops, farmers are facing pricey facility damage. According to ISU experts, grains swell when wet, so bin damage is likely. Wood structures will be hard hit and may retain mold and contaminants. Not only does flooding impact their grain and facilities, but it also delays planting of this years crop, Mohler said. MAKING hay might be easier when the sun shines, or so the old adage goes. But cutting enough straw, it turns out, can be a lot harder. Scottish farmers were not long in to last year when they realised they had less straw, and that the stalks they did have were shorter than usual. They had suffered a wet autumn in 2017, hitting their winter crops, before a big winter and spring freeze and a scorching, grass-drying summer.